OutCide provides cleaning solutions suitable for all kinds of hard surfaces, including concrete, tarmac, block paving, natural stone and gravel driveways. Our safe and modern treatments are highly effective against biological growth like weeds, moss, algae, fungi, lichens, and even stubborn stains caused by rust and oil. To clean hard surfaces like concrete, tarmac and block or stone paving, we use a range of specialised equipment and techniques including Algoclear® Pro Softwash (Professional Use Only), Mosmatic surface cleaners, powered spray systems, wet/dry vacuuming, chemical stain removers and occasionally pressure washing as appropriate. While traditional jet washing and power washing may provide an immediate visual quick fix, it does not actually kill the weeds, moss, lichen or algae which may quickly return, and the high pressure process can damage the finished surface and joints. 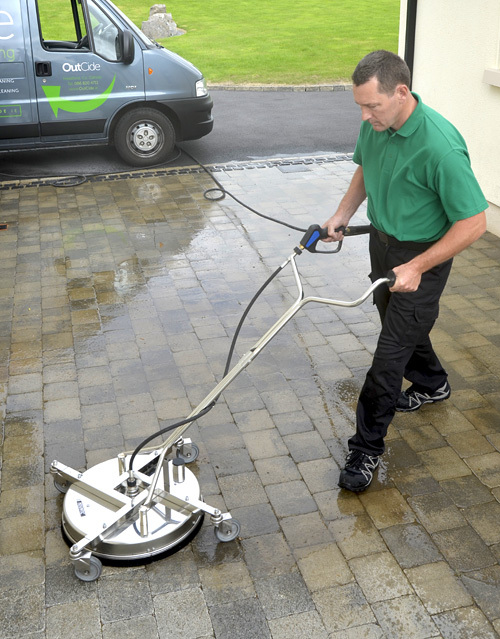 For more information or a free survey of hard surface cleaning for your property in Galway or Mayo, please contact Seamus Staunton on 086 820 4711 or email info@OutCide.ie. We will be happy to provide a no obligation quote and estimate the results you should expect to see on your property. For your peace of mind, Outcide Environmental Services Limited has arranged comprehensive Public and Products Liability Insurance, and can provide proof of cover before commencement of work.